Luke Kelly-Melia suffers from cerebral palsy and was given the assistance dog as a result. 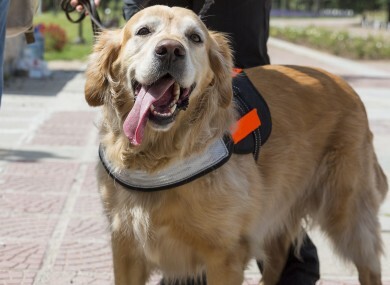 File photo of an assistance dog. A TEENAGE BOY (17) with cerebral palsy has been awarded €5,500 after his former school discriminated against him by not allowing him to bring his assistance dog to school. Luke Kelly-Melia was stopped from bringing his assistance dog Aidan to his school when he was in sixth class. The ruling published recently on the Workplace Relations Commission (WRC) website found that Luke had been discriminated against by his school on disability grounds. Luke is not named in the ruling, but his family have gone public with the story. The school in question - Knocktemple National School in Virginia, Co Cavan – had taken an “obfuscating and close-minded approach to the request” to allow Luke to bring the dog to school, the equality officer of the WRC found. Equality officer Orlaith Mannion found the school had a “Just Say No” policy towards allowing the dog access. The case dates back to 2011, when Luke was 12 years old and in sixth class. The case was heard last year, but the decision was only published a few days ago. In November of that year he was given the stability dog – Aidan – by the Irish Dogs for the Disabled charity. He had been moved up the list due to his deteriorating condition as a result of a growth spurt. He had been in the school since junior infants and had a full-time special needs assistant. Luke’s parents said they had discussed the dog with teachers and there had been no problem with it being introduced. At the end of the term, however, the school’s principal sent a letter to the family saying that permission to have the dog in the school would have to be sought in writing to the board of management. The letter also stated that Luke would have to stop bringing Aidan to school until the board decided on the matter. Luke’s parents took him out of the school following this and home schooled him until the end of the school year the following June. At one point the school wrote to Luke’s parents saying that it would notify the National Education and Welfare Board (NEWB) if Luke was taken out of school. Speaking this morning on Today FM’s the Anton Savage Show, Luke’s mother, Pauline Kelly-Melia, said that the whole situation had been difficult on Luke and the family. She said that when he started post-primary school the following September he had been stressed following what had happened at Knocktemple. “He came into that school quite shook,” said Pauline. For the first few months he was in there he was constantly worrying. He was stressed when he went in there and his attitude towards authority was quite negative as a teenager because his experiences had been so negative. However, Pauline said that the post-primary school had done “a wonderful job of turning it all around” and making Luke feel welcome. “They took Luke in with open arms and they worked so hard to make it work for him,” she said. In its ruling, the commission ordered that the school redraft its policies so that they are in compliance with the law. It also ordered that a report on progress of this policy review must be made to the Irish Human Rights and Equality Commission (IHREC) within one year. If this isn’t done, the commission said the IHREC could apply to the District Court for this order to be enforced. Email “Teenage boy awarded €5,500 after management stops him bringing assistance dog to school”. Feedback on “Teenage boy awarded €5,500 after management stops him bringing assistance dog to school”.